On December 1st at 7:00 P.M the anticipated wait for City's winter home opener will be over. Lansing City Futsal will take on Columbus Futsal at the Aim High Sports Complex! City is coming off a third place finish in the National League of Professional Futsal season that ended in August. City ended the season on an absolute tear winner 7 out of the last 8 games. They will look to continue that momentum this winter season. The last City Home game (July 2017) recorded a record number 700+ fans that came out to support Lansing City! Will that record be broken again in December? City's Jeremy Klepal and Alexis Mendez are returning this season after proving to be a lethal attacking duo last season. Alexis recorded 9 goals last season and Klepal finished with 19. Adding to that duo is a brand new face for Lansing City, Em manuel Belliard. Belliard will be playing for City after professional Futsal stints in the Dominican Republic and in Spain. City also has used this off-season to bring in Aldony Mendez. Aldony will be another scoring threat for City. Aldony played professional soccer in Guatemala before returning to the United States last year. City players Jared Wilson-Santos, Danny Buegar , and Washington Matues among others will also be returning to the squad for the Winter Season. City and Columbus have faced off twice, once in Lansing and once in Columbus. 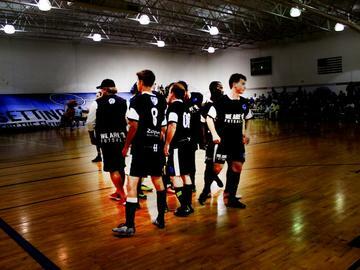 City won both of the intense futsal matches Both games against Columbus were a sight to see. Columbus plays a controlled, disciplined, and defensively stout game. City plays the exact opposite style of futsal. A high flying attacking style that proved to be a very interesting combination with Columbus. Get ready for a battle.